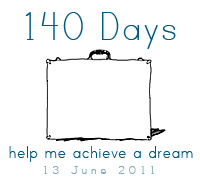 So, what can you do in 140 days? You can send me to school, that’s what you can do. Last Wednesday I went to visit the Chicago Portfolio School. I loved it. I sat in on a class, and was able to not only keep up, but complete the assignment in my head. (It was an intermediate typography class — and I’ve been itching to attend a typography class for a while now…) Anyway. The school was awesome. As soon as I walked in, I knew this was the place I needed to be. On Thursday, I received an email stating “Welcome to the Chicago Portfolio School!” I had been accepted. I was, and still am, beyond excited. This is exactly what my life needs right now — a chance to refine my skills and truly prepare myself to be competitive in my field. To actually become a designer, get a job, and just love life. Well, all of that comes to a screeching halt. I can’t get a loan. I made some mistakes with a credit card back in 2009 — when I quit my job at Northwestern (which I still don’t completely regret — no one should need to take antidepressants and anti-anxiety medication just to function at work). Since then I’ve been trying to get myself out of that debit. But having a job with low pay, and that didn’t pay us overtime… that didn’t help. I was barely breaking even after my living expenses (even if I went without food). Then I got sick — and well, this whole endometriosis thing isn’t cheap. I thought my new marketing job was going to make everything better. It was the bandaid I needed. Well, all that went down the drain when the company went out of business. So, despite how hard I’ve tried to get this all fixed, it just hasn’t happened. So I need help. I absolutely cannot do this alone. So in 140 days, you can do just that. You can help me go to school by giving a financial gift (via edulender). I don’t ask this lightly. Honestly, I wish I could just get a loan and have everything be easy. But that’s not the way it is. I need help. Plain and simple, in order to accomplish this, I need your help. 140 days from now is my 27th birthday. Throughout this period, I will be posting various challenges (like needing $500 to secure my spot by April). All of these will also be posted on the fundraising website. And I absolutely cannot express how grateful I am of those who are supporting me — financially or otherwise. If you know of any places that would be able to help me get a loan or a grant, I would really appreciate it. $75 – your choice of 8×10 print. $150 – a banner/header for your site. $500 – custom website built on Thesis.